Tuesday night in Zanzibar. They’re watching Thames Television. Time was when the countries watching Thames Television didn’t even run from A to B, let alone Z. 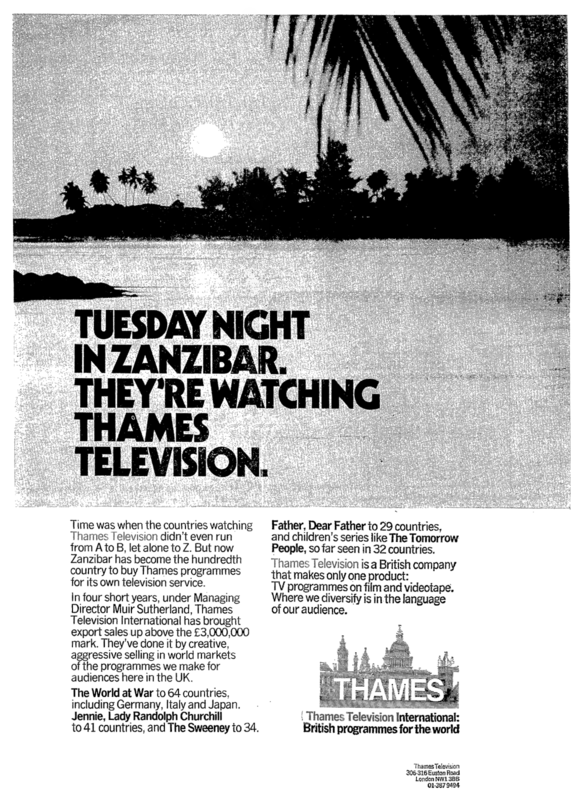 But now Zanzibar has become the hundredth country to by Thames programmes for its own television service. In four short years, under Managing Director Muir Sutherland, Thames Television International has brought export sale up above the £3,000,000 mark. They’ve done it by creative, aggressive selling in world markets of the programmes we make for audiences here in the UK. The World at War to 64 countries, including Germany, Italy and Japan. Jennie, Lady Randolph Churchill to 41 countries, and The Sweeney to 34. Father, Dear Father to 29 countries, and children’s series like The Tomorrow People, so far seen in 32 countries. Thames Television is a British company that makes only one product: TV programmes on film and videotape. Where we diversify is in the language of our audience.